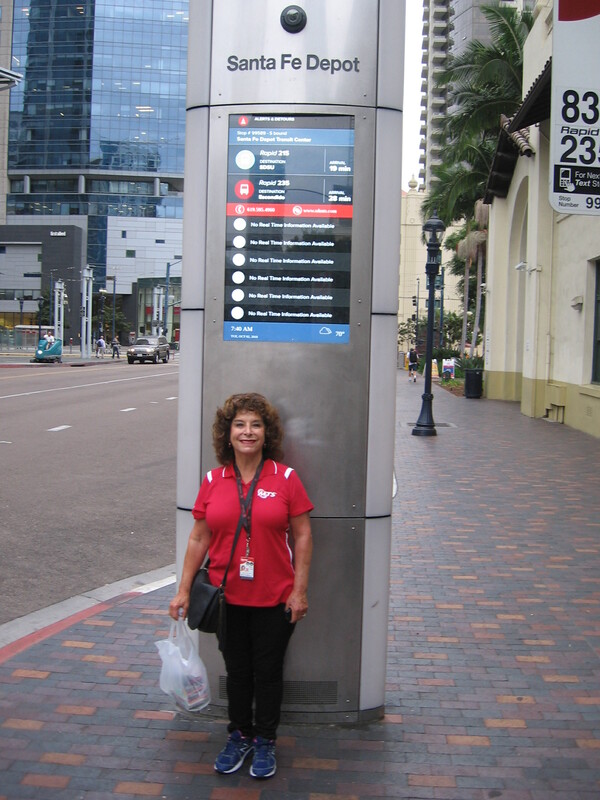 trolley – Cool San Diego Sights! 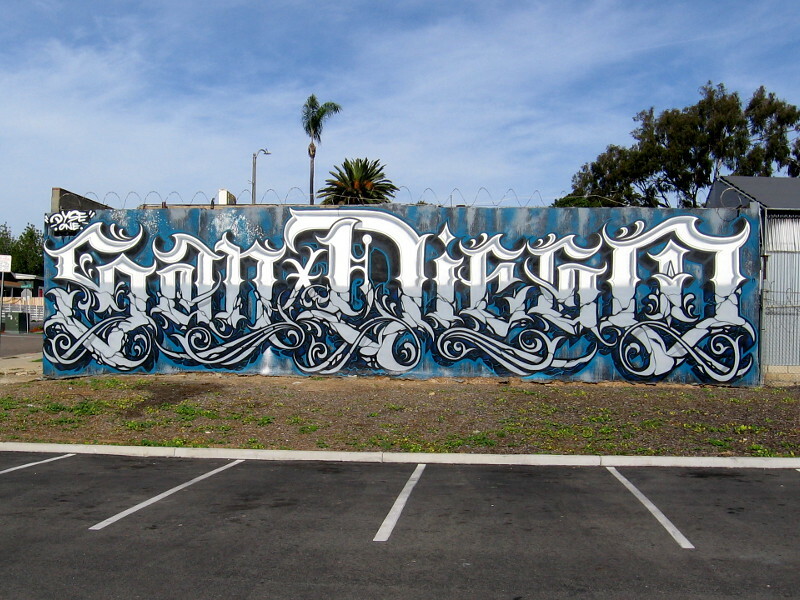 One very cool “San Diego” graffiti mural! 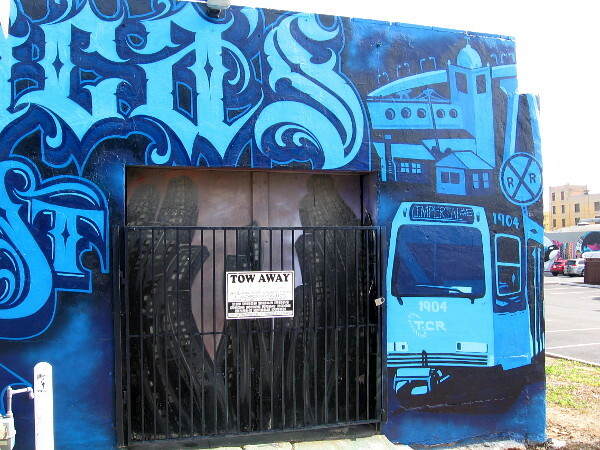 The very cool “San Diego” mural at 20th Street and Imperial Avenue painted by Dyse One. Check out this cool mural painted on the south side of the Universal Radiator building at 20th Street and Imperial Avenue. 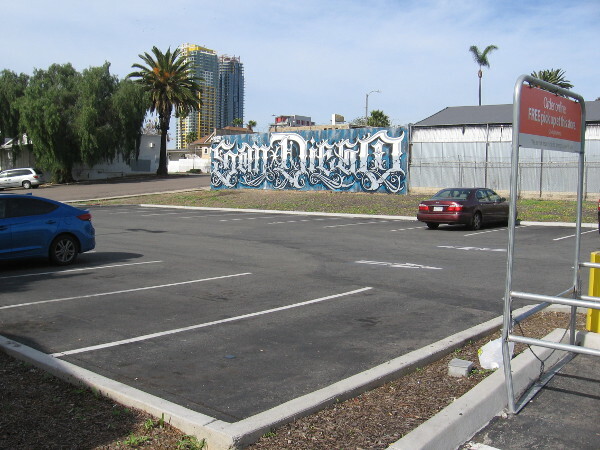 Local artist and clothing designer Dyse One spray painted an immense “San Diego” in an elegant graffiti style! 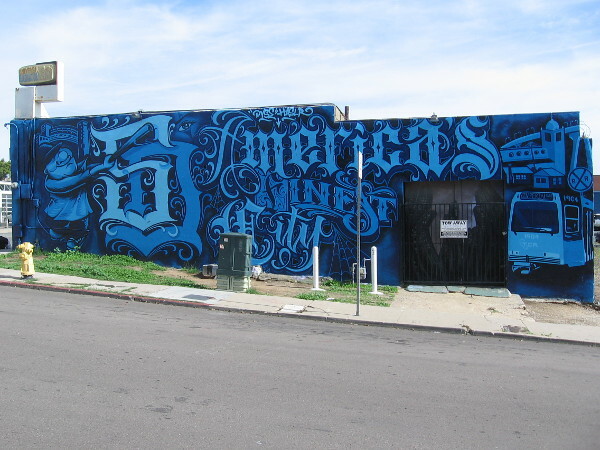 The west side of the same building was painted by Dyse One and Haslr, and contains elements that represent America’s Finest City. I see images of the Coronado Bridge, a trolley, and the Padres’ mascot, the Swinging Friar! 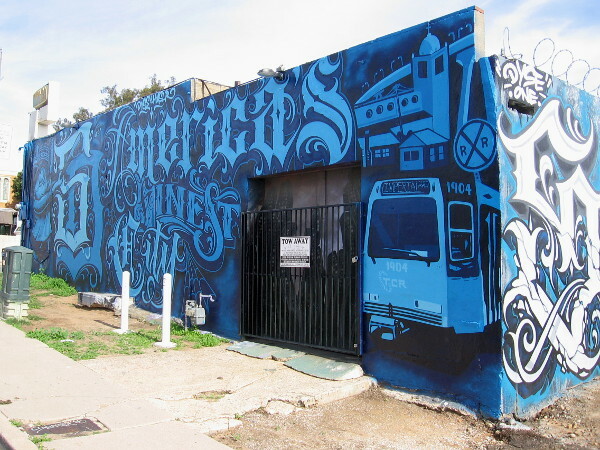 A cool mural on the west side of the same building pays tribute to America’s Finest City. 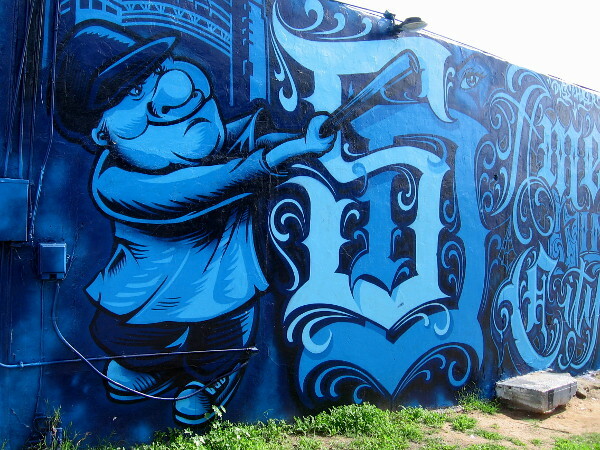 By street artists Dyse One and Haslr. 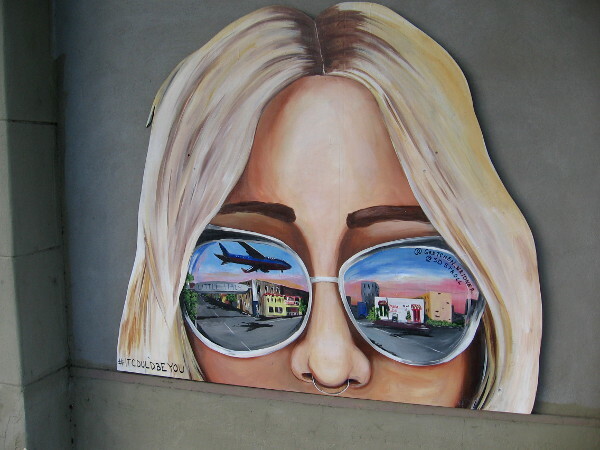 Posted on January 29, 2019 Tags art, artists, city life, community, cool, graffiti, murals, padres, photo, public art, san diego, street art, trolley, urban artLeave a comment on One very cool “San Diego” graffiti mural! More fun artwork discovered in Little Italy! Cool sunglasses reflect images from Little Italy. Early yesterday morning I enjoyed a long walk through the streets of Little Italy. I discovered some fun artwork that I hadn’t previously photographed! 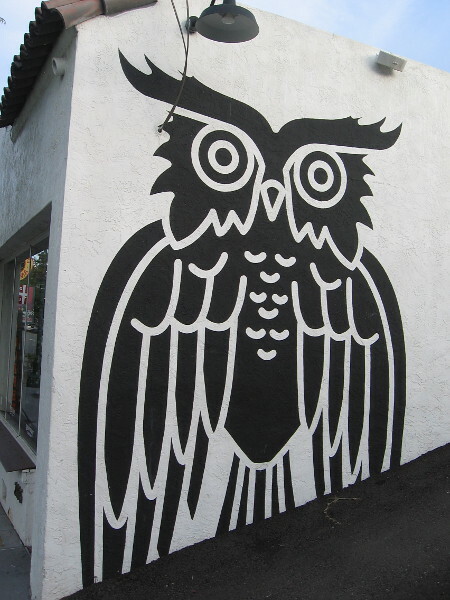 An owl watches over India Street. 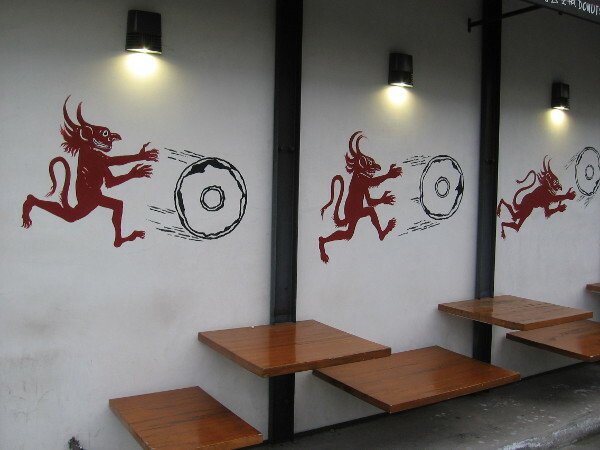 Devils roll some very tempting donuts. 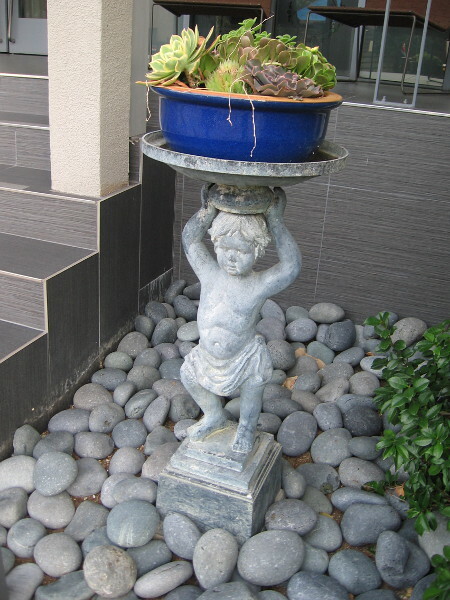 A sculpted cherub balances a potted plant atop its head. 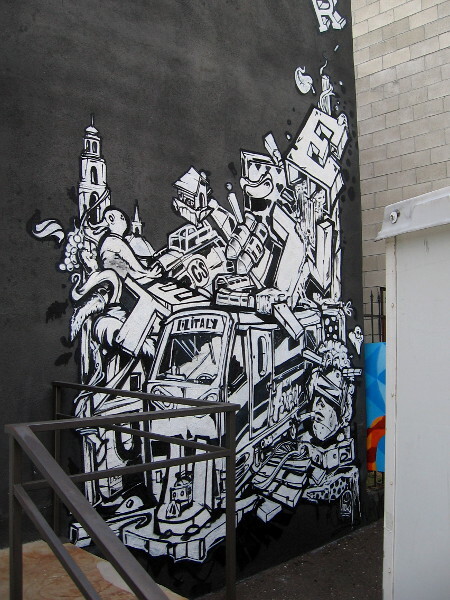 Awesome street art on one corner of a Little Italy building. It appears the San Diego Trolley has arrived in dynamic Lil Italy! 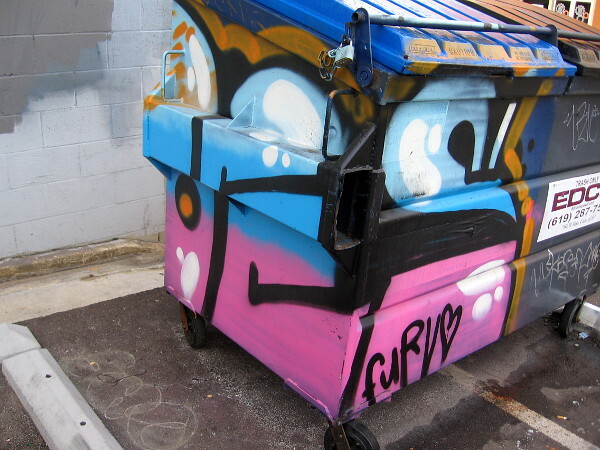 Posted on December 13, 2018 Tags art, artwork, creativity, donuts, fun, graffiti, imagination, little italy, photography, spray paint art, street art, trolley, urban art, walking3 Comments on More fun artwork discovered in Little Italy! Big smiles for Free Ride Day! 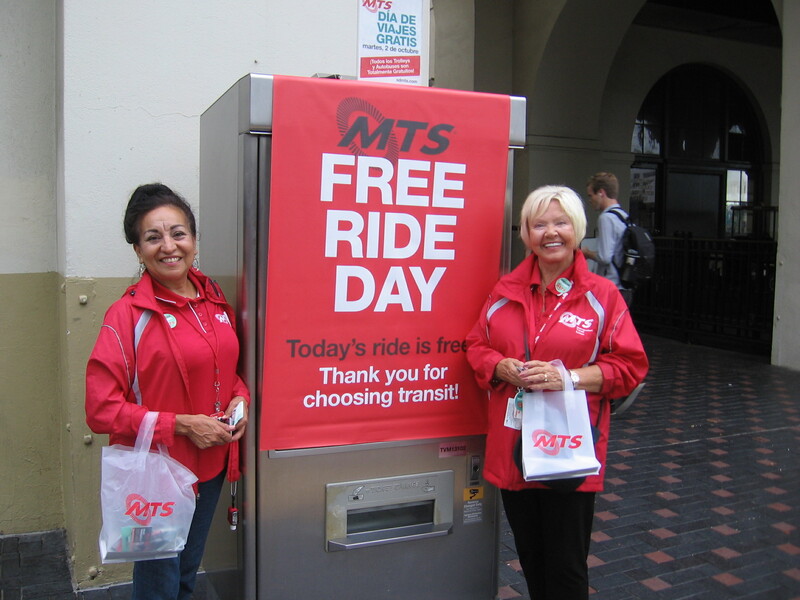 Today is Free Ride Day in San Diego! 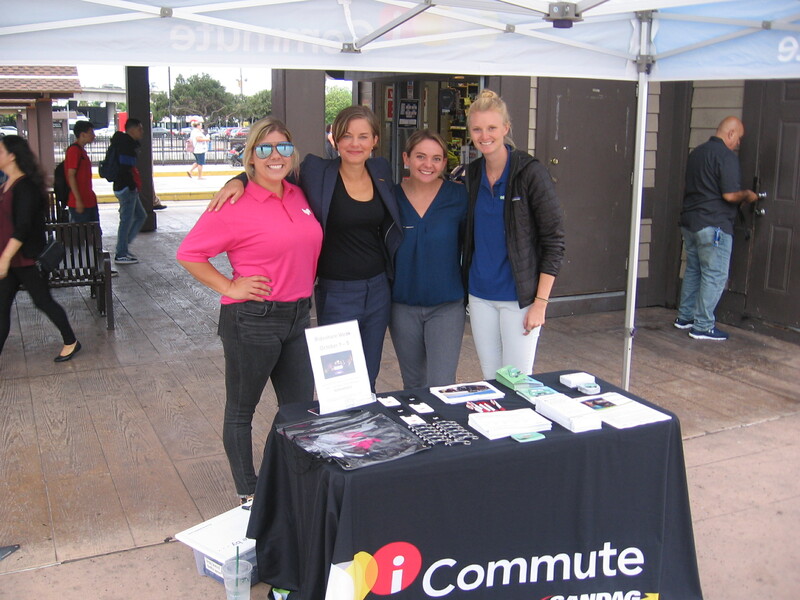 San Diego’s Metropolitan Transit System and North County Transit District are providing a fun, free ride to anyone riding the trolley, bus, Coaster or Sprinter! And as an extra added bonus, lots of smiles are included! 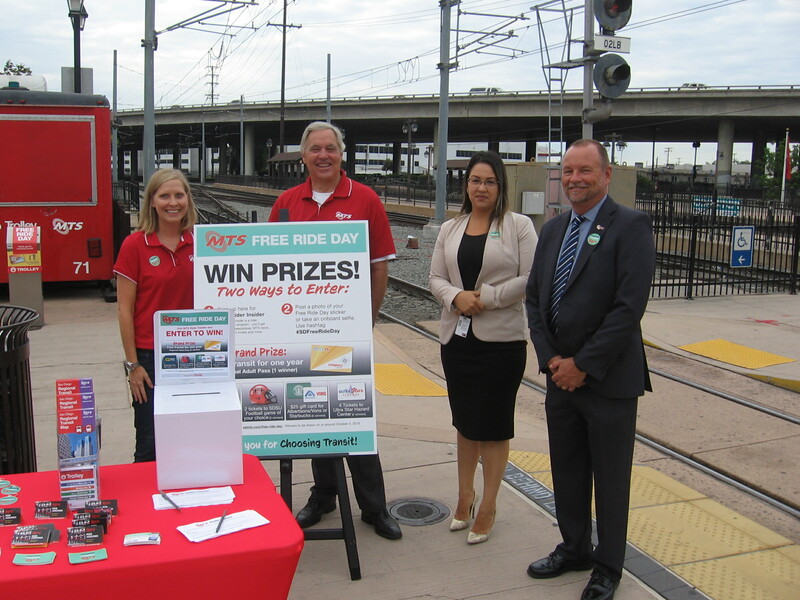 Posted on October 2, 2018 Tags city life, events, free, fun, happy, photography, san diego, san diego trolley, smile, transportation, trolley, trolley stationLeave a comment on Big smiles for Free Ride Day! 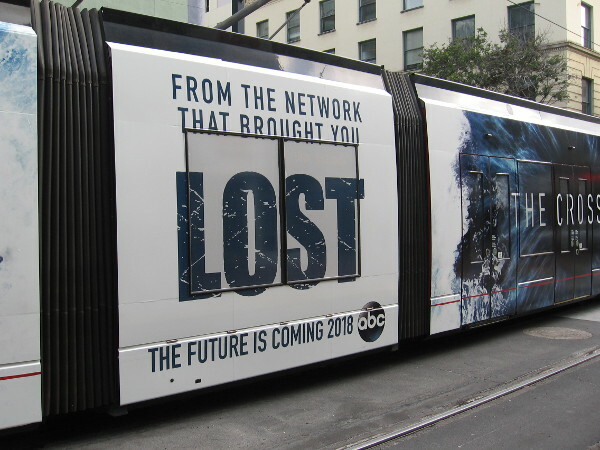 First 2018 San Diego Comic-Con trolley: Syfy! 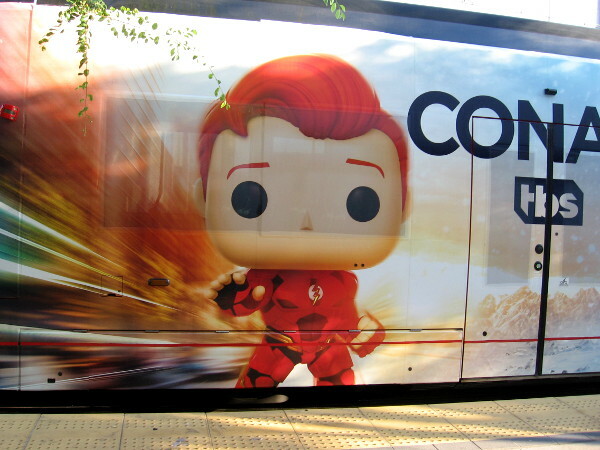 The first trolley wrap for 2018 San Diego Comic-Con features two Syfy shows–Krypton and HAPPY! More than a month to go until 2018 San Diego Comic-Con and trolleys are already getting wrapped! 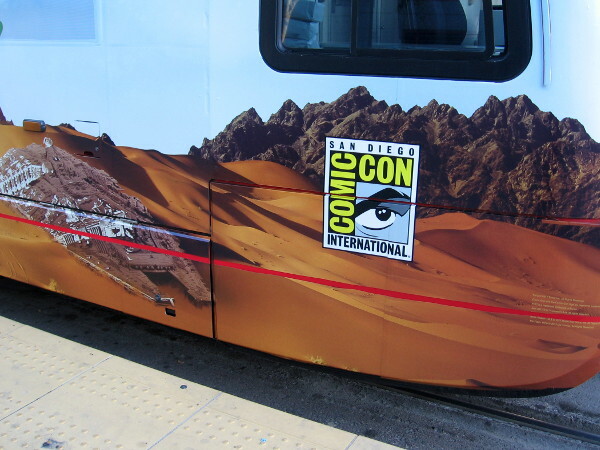 A record 40 or more trolley cars will feature Comic-Con graphics this year, according to MTS! I spotted the very first wrap this morning at the Little Italy station! Here are my quick photos! It appears Syfy will be returning to San Diego Comic-Con in a big way in 2018. The wrap promotes two of their shows: Krypton and HAPPY! Both series have been renewed for a second season. I noticed that Syfy’s slogan from last year–It’s a Fan Thing–is being referenced once again. On this trolley the words read: It’s a Fan Made Thing. The Krypton art was created by Moritat, a comic book creator who has done some work for DC. The HAPPY! 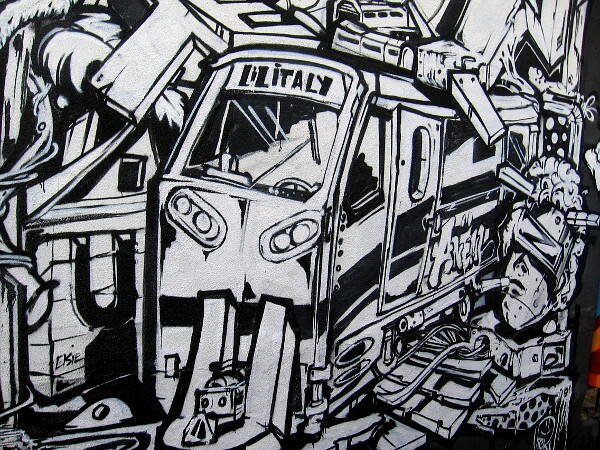 trolley art was created by a fan named Alyssa Veysey. You can see her personal DeviantArt page, including the HAPPY! trolley artwork, here. Because I live in downtown San Diego, I plan to take hundreds of photos during Comic-Con, as I’ve done the past few years! 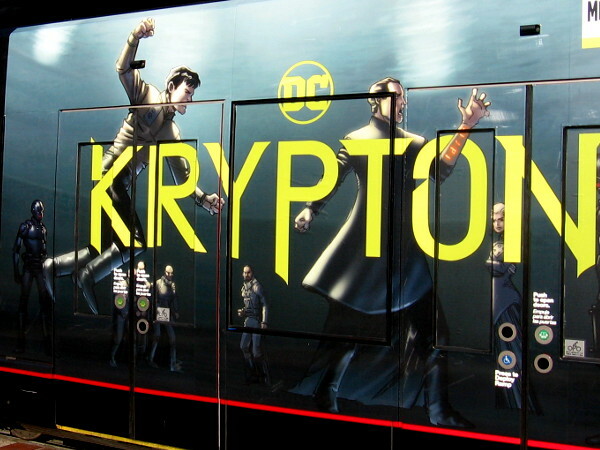 A closer photo of the Krypton trolley graphic. 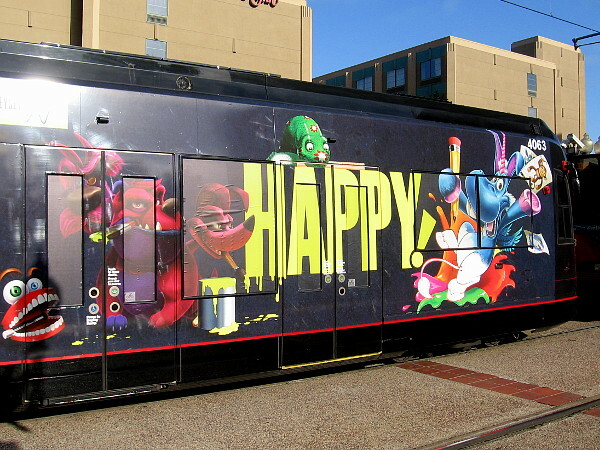 The other half of the trolley car features imaginary characters from the highly original fantasy-comedy-crime show HAPPY! A three-headed dog named Raspberry! It’s a blue, flying unicorn named Happy! A couple days later, and I’ve spotted a second San Diego Comic-Con trolley wrap that promotes the two Syfy shows The Magicians and Wynonna Earp. 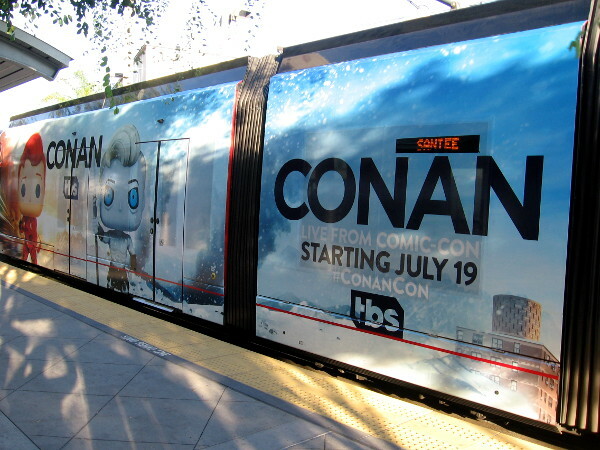 A cool Syfy wrap on a San Diego Comic-Con trolley. It’s a fan made thing. Find your fan thing! 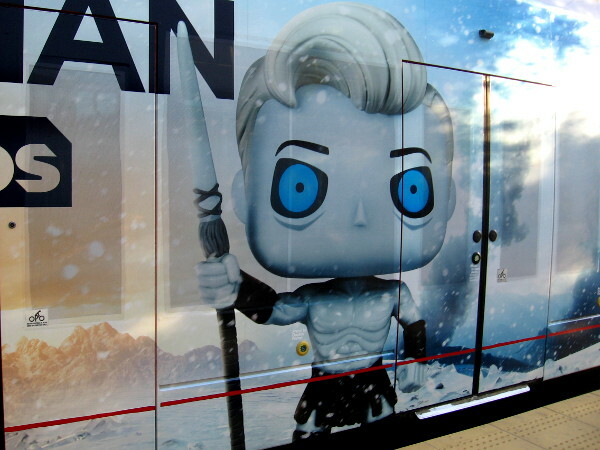 A Comic-Con trolley wrap that promotes The Magicians on Syfy. Another photo of the graphics for The Magicians. 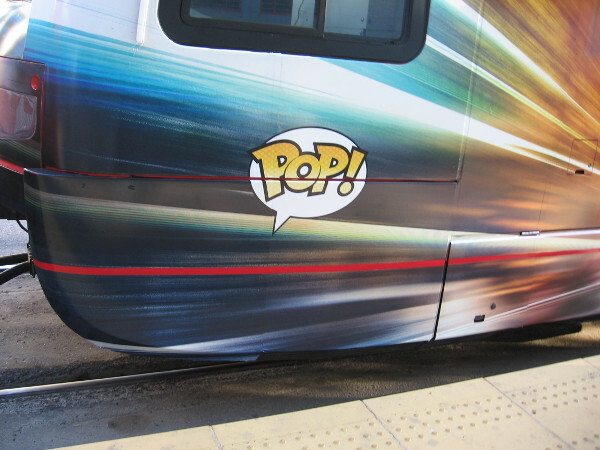 The other half of the San Diego Trolley car promotes the Syfy show Wynonna Earp. The characters of Wynonna Earp are portrayed on playing cards. Here’s another Syfy trolley car I’ve spotted! This one promotes the shows Nightflyers and Deadly Class! Nightflyers graphics on a 2018 San Diego Comic-Con Syfy trolley wrap. A second photo of the Nightflyers trolley graphics. Deadly Class, another show on Syfy, is promoted on another half of the trolley car. 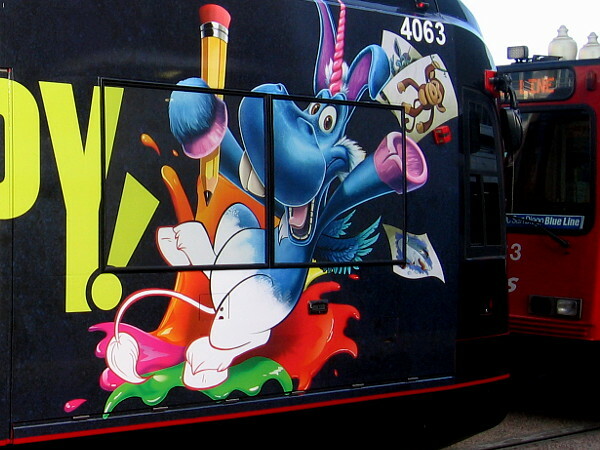 Deadly Class on Syfy is being promoted on a San Diego trolley car with cool fan art. Second photo of the Deadly Class San Diego Comic-Con trolley wrap! Posted on June 7, 2018 June 11, 2018 Tags art, comic books, comic-con, entertainment, fantasy, happy, photo, pop culture, san diego, san diego trolley, science fiction, superman, television, trolley1 Comment on First 2018 San Diego Comic-Con trolley: Syfy! New 2017 Comic-Con trolley wrap: The Crossing. 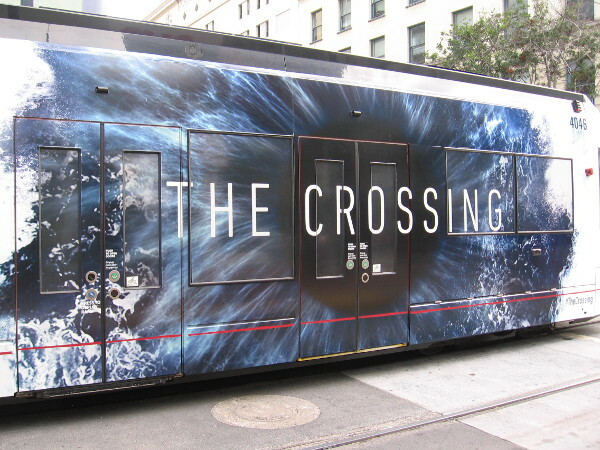 A fourth trolley wrap for 2017 San Diego Comic-Con promotes The Crossing, a new television series that will debut later this year on ABC. Look what I spied a short while ago! A fourth trolley wrap for 2017 San Diego Comic-Con! This one promotes a new television show that’s coming to ABC. The Crossing will be about refugees from a war-torn future in America–refugees who have traveled back in time 250 years. Sounds like an intriguing idea! From the network that brought you Lost. The future is coming on ABC. 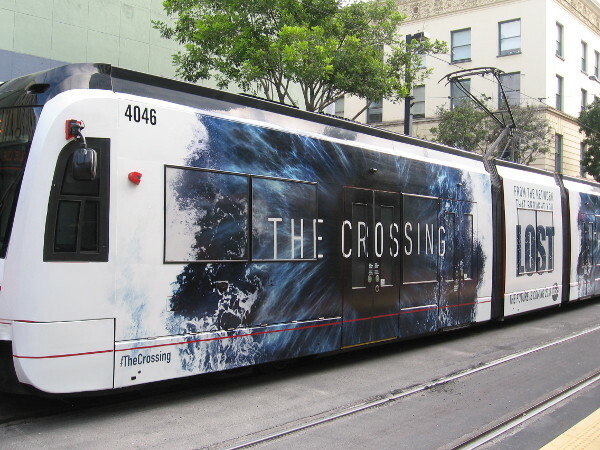 The Crossing wrap on a San Diego trolley is spied downtown several weeks before 2017 Comic-Con. You can easily explore Cool San Diego Sights by using the search box on my blog’s sidebar. Or click a tag! There are thousands upon thousands of photos for you to share and enjoy! Including many photos of past San Diego Comic-Cons! 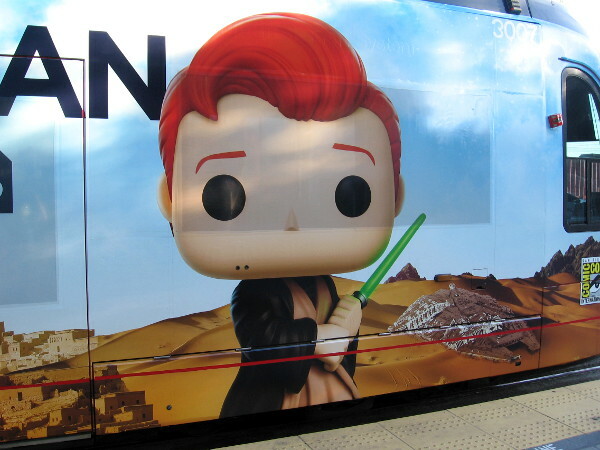 Posted on June 29, 2017 Tags advertisements, comic-con, cool, downtown, entertainment, events, marketing, photo, pop culture, san diego, san diego trolley, science fiction, television, trolley1 Comment on New 2017 Comic-Con trolley wrap: The Crossing. The Gifted trolley wrap for 2017 Comic-Con! 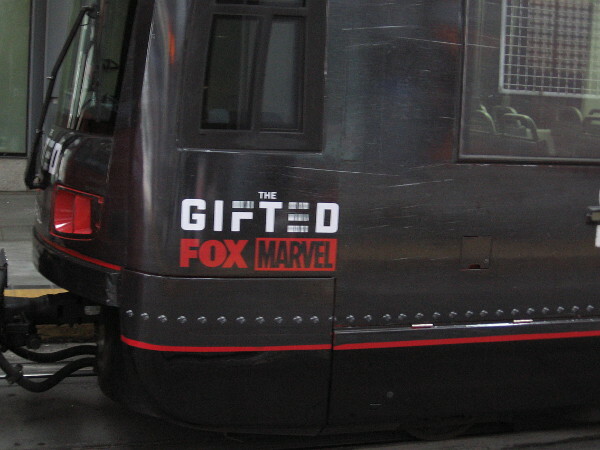 New trolley wrap for 2017 San Diego Comic-Con promotes The Gifted, an upcoming Marvel series on FOX. I spotted a third new trolley wrap for 2017 San Diego Comic-Con! This cool wrap promotes the upcoming FOX series The Gifted, which will concern Marvel’s universe of mutant X-Men. 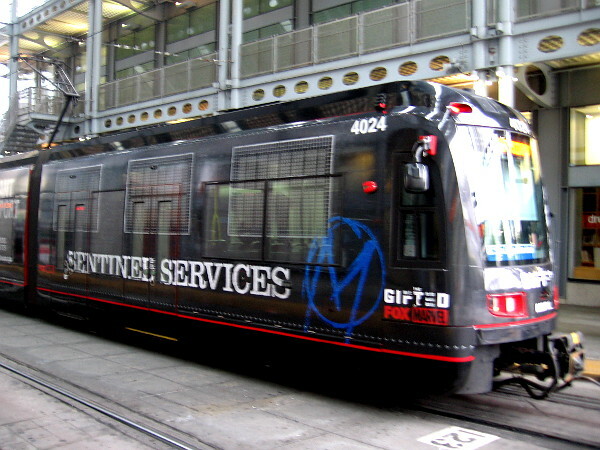 Looks like the Sentinel Services mutant transport will be filled with gifted Comic-Con attendees this year! Hopefully it transports them to the convention center, and not somewhere less pleasant! I spoke to an MTS supervisor at America Plaza and he believes there will be one more wrap this year! The Gifted will be based on Marvel’s popular X-Men characters. 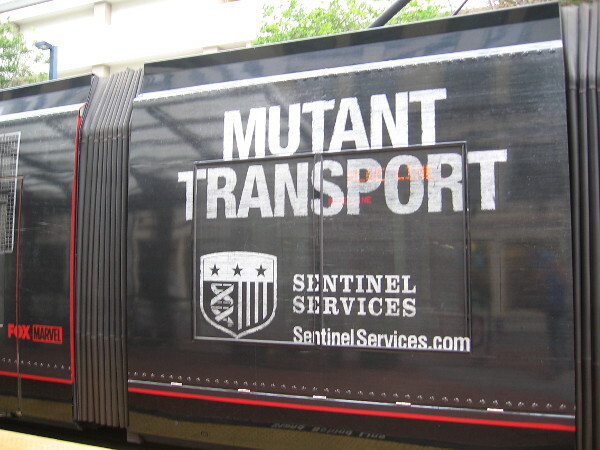 During San Diego Comic-Con, lots of mutants will be transported on this Sentinel Services vehicle. I wonder if it’s made of plastic. Magneto might make an appearance! Here’s another photo I captured the following day! That looks like some sort of prisoner transport. Wait! Don’t go in! And yet another photo! There now seems to be a different variation of this wrap for the older style trolleys. It comes with a warning! Mutants Aboard. For your safety please keep your distance. 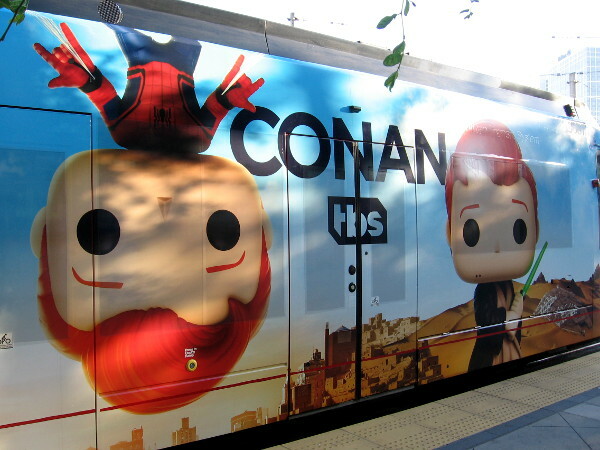 Posted on June 23, 2017 June 26, 2017 Tags comic-con, cool, events, marvel, photo, pop culture, san diego, san diego trolley, superhero, television, trolley, x-men1 Comment on The Gifted trolley wrap for 2017 Comic-Con!